Armour Hill terminus of route 18 in the early summer of 1961. Trolleybus #174 is seen on Factory Bridge [Kings Road] en route for Wokingham Road on route 17 in 1961. 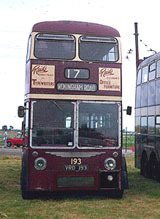 Trolleybus #192 is seen using the Whitley Wood overhead reverser. The only other reverser that could be found on the system was situated at the junction of School Road and	Westwood Road in Tilehurst, between May 1939 and April 1966. Trolleybuses turning there would show the destination of Westwood Road/Tilehurst and turned right from School Road into Westwood Road and reversed back out again into School Road. 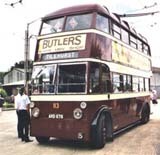 With traffic becoming heavy in the area the reverser was removed in April 1966 as it was deemed too dangerous for trolleybuses to reverse back out on to the main road. The picture of trolleybus 180 was taken at Cemetery Junction on the 31 December 1967 while on hire to the NTA. It is seen having arrived from the Liverpool Road terminus and is about to run round the corner on batteries to Wokingham Road and then re-connect with the overhead [there was no direct wired link]. This was common practice on tours of the Reading system. [Later that day the same NTA tour used BUT trolleybus #150 to close the Northumberland Avenue to Stations route]. Broad Street, the main shopping thoroughfare in Reading. This picture was taken by Geoffrey Tribe and is reproduce with permission. A big trolleybus event in May 2006 was the weekend of Reading Trolleybuses at Sandtoft. 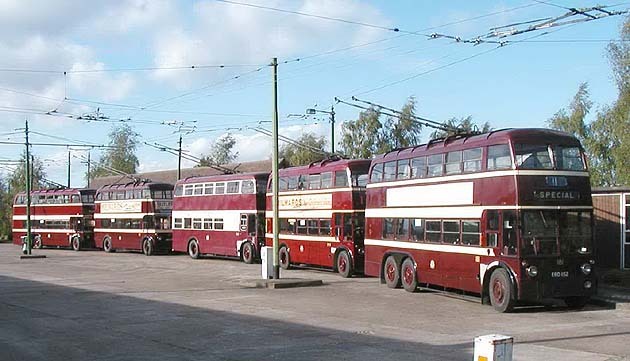 Here, five remaining Reading trolleybuses were assembled from around the country, and all of them operated! 193 was only on demonstration runs, however, as a failed trolleybase the day before the event meant that the last bits of restoration had to be abandoned whilst this was fixed. Others had been through an intensive restoration programme to make them fit and operable for the event. 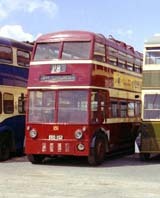 In addition there were six visiting preserved Reading motor buses present. 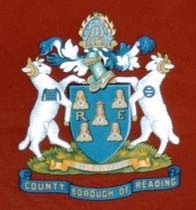 The event was fantastic and was absolutely great for anyone who remembers the trolleybuses of Reading. Only a picture of the line up appears here, but more can be found on the BTS website at www.britishtrolley.org.uk, and selecting the Reading weekend link. From this there is a further link to a page of photographs from the event. for caption information on this page.